Purpurite and Red Jasper for Full Moon in Sagittarius and Solstice 6-20-16 – GemPowerment. Reveal your light. Purpurite is the perfect emanation of the Violet Ray of Transformation. Greetings my Beloved, Sparkly, GemPeople!! Welcome to this truly unique Cosmic Light Bath of energies! 2nd Full moon in Sagittarius on a row, with Sun in Gemini, in the 29th degree, and a Grand Mutable Cross, followed 12 hours later by the Solstice and the Sun moving into Cancer. WOW. And that’s not all of it…there are many other influences right now and I will invite and encourage you to do your own research on all of that since there is simply too much to cover in what needs to be a rather brief post. So, I’m going to jump right to the meat of the message, which is…as always for me…about which are the best stones or Mineral Allies to assist us with these energies. Guidance has given me the message of utilizing Purpurite to optimize the Full Moon energies, and Red Jasper to work with the Solstice energies. However, because these effects are working in conjunction, both stones are activated for the next two weeks until the New Moon in July, and then Red Jasper remains a basic stone to work with through the next Solstice in 6 months. For both these stones the best way to work with them is to use dedicated stones of your choosing (raw, polished, size, etc.) and keep them on your person during the day, preferably touching the skin. At night they can go on your bedside table to stay in your field and work with you in your dreamtime. If at any time you feel one or both of the stones gets “cloudy” energetically, clean by running under water, set in rice, use sage or cedargrass or palo santo smoke, but avoid using salt as this will erase the program you installed during your dedication. So let’s look at our first stone, Purpurite. This is a manganese iron phosphate with a medium hardness of 4.5 – 5 on the Moh’s Scale. This stone is not really seen much in general crystal circles, which actually it’s a bit baffling to me since this stone beautifully blends the Violet Ray of Transformation with some really solid grounding elements. Perhaps it’s because this stone very rarely if ever, forms crystals, due to its opaque orthorhombic structure and the nature of it’s component elements, along with its relative softness. But this is exactly the beauty: staying grounded and in-body while transmuting our 3D karma and activating our Light Bodies is the crux of what this time on Earth is all about. The Violet Ray encourages us to have insight and courage as we transmute outdated energies. 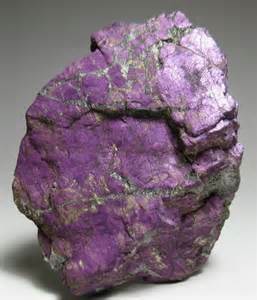 Purpurite, with its Violet Ray emanations, assists us in taking the next steps in our evolution. 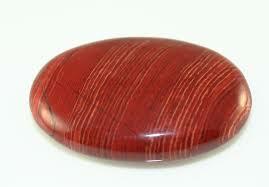 Red Jasper enhances the flow of Chi or Prana from the Earth to the Root Chakra. Working with Red Jasper in the next two weeks is the perfect accompaniment to the Violet Ray. This grounding, Root Chakra activating stone, is also protective in nature, allowing a feeling of relaxing into the embrace of Mother Earth and her rhythms. As we draw up energy from the planet we gain the stamina and vitality. The Solstice is always a gateway of light information which is fed to us via our local Sun from the Central Galaxy Sun. It is an invitation from the Cosmos to step up another rung in the ladder, both individually and collectively. What is happening with this combination of Purpurite and Red Jasper is forming a “light framework” in the spectrum. So on one hand we have the short end of the visible spectrum, the Violet Ray, and on the other, the long end of the visible spectrum of Light with the Red Ray. On one side, we have Purpurite activating the Crown and Brow Chakras, and on the other, Red Jasper activating the Root and Sacral Chakras. It’s like a door frame of the portal for us to walk through in the next two weeks. What we leave behind and what we choose to take with us through that portal depends on how well we’ve done our work in the last few months, and what our intentions are to create in the next 6 months. Wishing you Wellness at the Speed of Light and Joy in your Journey!